When you hear about the humble origins of Hootsuite, the Vancouver-based social media management platform, its development sounds mythical. They’ve seen massive growth in the past 5 years, an absurd 56,000%. In Silicon Valley terms, Hootsuite has become one of the billion dollar ‘unicorns’ we hear VCs chasing after. Living in San Francisco for ten years, I’ve seen and worked with enough startups to know this kind of success is not luck. So how did Steve and the Hootsuite team do it? According to Steve, “In an early stage organization, the people need to know that what they’re doing is valid and relevant, that it has purpose, and that there is a bigger vision. You’re essentially telling people you’re going to take them to the promised land that nobody’s seen.” It’s crucial to make sure that the whole team is aligned around a vision, so that each action is results-driven and connected to the bigger picture. With a five person sales organization, Steve went about executing a method he calls the 3 M’s: Mission, Model and Metrics. Mission (Why) — The corporate story everyone understands and is aligned around. Model (How) — A clear system for growth and an understanding of the strategy and levers that can be used to achieve it. The model is the foundation that the sales machine is built upon. Back then, Hootsuite wasn’t the slick, beautiful product it is today; like most startups, their initial offering had more in common with the cramped, East Vancouver office than today’s 33,000 square foot headquarters. They already had a friendly, accessible brand and a huge user base for their free product. Unfortunately, Hootsuite’s Enterprise product had a long way to go to become enterprise-ready. Looking to his startup predecessors at Red Hat, Steve found a model that gave him time to build out their enterprise offering while still charging enterprise rates and giving enterprise clients what they desperately wanted and needed: information, guidance, and support. Using this approach, Johnson set up customer support, training, and account management, while Hootsuite’s enterprise product features were built out. Metrics (What) — Measurements that can be externally benchmarked, from top to bottom of the funnel. For any sales organization, metrics are the pulse of your sales pipeline. They let you know what’s working, what’s not and many times, how to improve them. For Johnson to mold Hootsuite’s fledgling Pro and Enterprise products into a structured, scalable offering, the five person sales team had to be educated on the process of selling it. Steve, half serious, half laughing, says, “[early on] there was no process, there was no training. 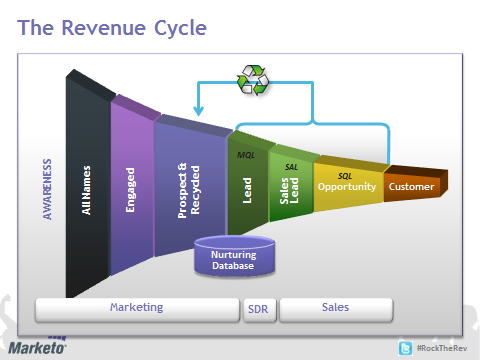 We didn’t have sales forecasts.” With the model in place, Steve went about focusing his sales and marketing team’s activities on metrics for users most likely to convert using a strategy Marketo coined, “Centralized Revenue Team.” This aligned the entire marketing and sales funnel around growth, providing clear expectations and deliverables for everyone involved. When Steve joined Hootsuite as CRO in 2011, they had recently launched their Pro (Dec 2010) and Enterprise (Jan 2011) products on the backbone of their Freemium product. They had little paid traction, but enough to know they’d found product/market fit. At the time, the company had only raised 1.9M in their Series A round and was located in a small office in East Vancouver, a block away from the free needle exchange. With a sense of gratitude and nostalgia, Steve described the location, “There was a left and a right way to enter the building. Going to the right was bad. The left was bad, but slightly better. We used to tell employees, ‘Don’t go to the right, you gotta go to the left!’” He says this last part with a chuckle. I couldn’t help but smile to myself as he said this, remembering my early office for Tallie on 6th and Bryant, where dirty underwear were a regular occurrence on the office doorstep. I know the story all too well. Thankfully, we’ve both moved up in the world. You can tell he’s glad that this scenario is behind them, but his recollection of Hootsuite’s humble beginnings as an early stage startup strikes a poignant, resonant chord with those currently in this period. Success for a company like Hootsuite can rarely be distilled into a system that seems so simple on the surface. I think Steve will agree, the company’s rise to prominence has a bit more nuance, and a few rough edges. He isn’t a superhero, but he does have a gift for strategic planning — Align the team around a vision, clearly define the model to execute upon, and develop a system of metrics-driven accountability. Did he have the ability to see into the future, to know what a huge success Hootsuite would be? Even now that Hootsuite boasts a customer success and sales organization of over 300 people, the answer is debatable. However, when you lead with vision and provide a clear plan to accomplish that vision, the road to success becomes much more predictable. If you’re looking to scale your sales team, I’d suggest following Steve’s lead. Identify a clear mission/message that sales, marketing and your customer can understand about why you are doing what you are doing. Look to your predecessors and design a business model to role out. It is rarely product’s fault for not winning a sale if you’ve found product/market fit. Reasons are nicely disguised excuses. As a sales leader if you’re buying your teams excuses, then your client isn’t buying your product. Crunch the numbers from beginning of the funnel to then end. Diagnose the team’s weaknesses by benchmarking against comparable business models. Establish training and processes to close the gaps. Interested in learning more about selling for Seed and Series A companies, follow my blog. Upcoming articles include redefining the concept of selling, the importance ‘founder selling’ and an interview with Booth Professor, Craig Wortmann on Entrepreneurial Selling.